Like ArcheAge was, Black Desert has been on my radar for quite some time. But because of the lack of information and not wanting to put up with a fake SSN and use a VPN to play a Russian/Korean version of the game, I decided not to post about it at all, until the release would come close and I gathered information about the game and if it's worth to actually play it (and from what I've seen, IT IS - will post that later this week). But first things first... Release date for Black Desert will bea early 2016, so my guess will be April 2016, because of the Korean fiscal end-of-year. With that, the game will become Buy2Play in the West (US and EU) with a cash shop (hope it's mainly cosmetics, mounts and leveling help - no OP gear and such) and there will be an IP block in place so that only US and EU (excluding Turkey & parts of Russia) will play here. 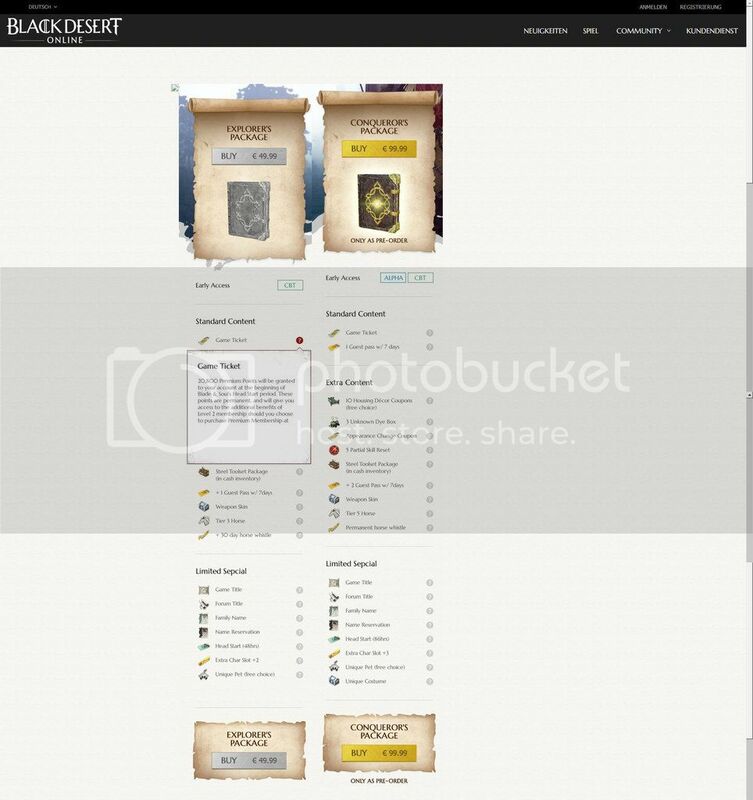 Then the leaked foudner packs (see screenshot above, pulled by Daium very quickly though)... They're priced �49 and �99 and I gotta say that if these prices will stay, they're not to bad. 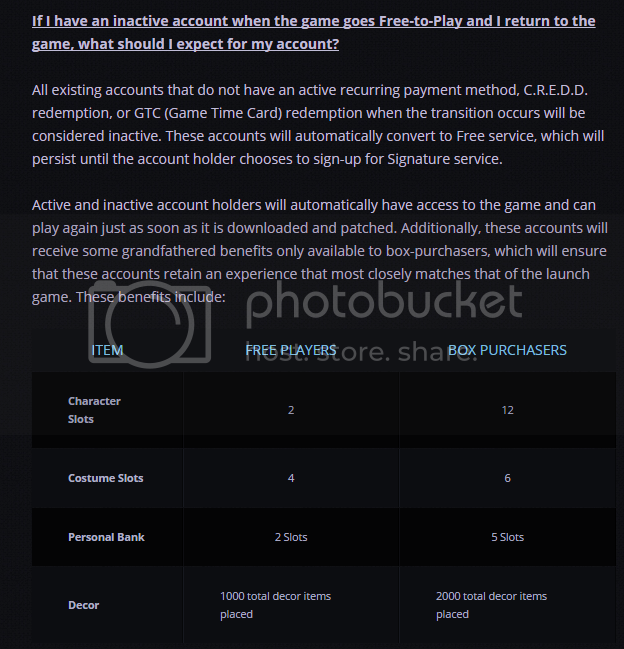 Most Buy2Play MMOs cost between �45 (GW2) and �60 (ESO) and have a cash shop as well in them. The rewards listed seem pretty good as well, and might also be an indication for the contents of the cash shop. Star Citizen & Shroud of the Avatar are vaporware? First look will be Star Citizen. It is the biggest crowd-funded game ever with over $50M pledged in total already. And where did the money go so far? Well, I'm not really sure to be honest. We have a very small dog-fight game right now available on only 2 maps and one racing map as well. Not to mention all those ships that have been sold (and some have actually been developed), of which most can't be used yet in the forenamed maps. The promises were good though. Chris Roberts promised an open universe with trade, mining and exploration (much like EVE online), landing on planets with missions and huge cities (like Mass Effect but then bigger and better) and a dogfight mode - and that all in a MMORPG environment. Man I was hyped to the max and bought a small ship and the dogfight access pass (�40 total). Then Shroud of the Avatar. 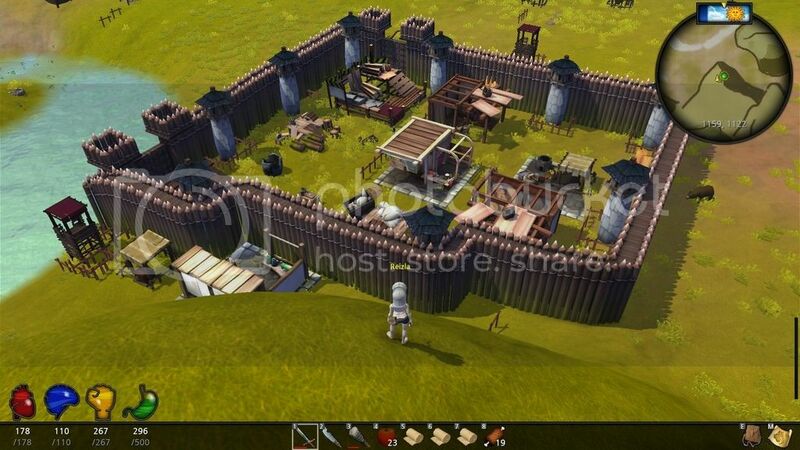 I realize that it's a sandbox and that it's (according to the game itself) still in pre-alpha state. I am okay with that. But I've pledged for the game in November last year for around �40 and so far I haven't really seen any development. Okay, there are lots of updated coming through Steam for the game and I do get emails with the state of the game and all that's going on behind the scenes, but I STILL DO NOT SEE ANY DIFFERENCE. And when I look at the game now and the future road laid out for it I'm really starting to wonder. First off, the music score is all played contributed. This forms a problem already because when a dozen players (not sure how many players do contribute for the game) make music for it, you have a dozen different music styles in ste game already. Add to that that for a large number of tracks I've already heard familiar tunes from the MAGIX/Catooh music library, which makes you wonder about the average skill of the 'composers' of the music. Not to mention, Lord British has been given $25M from NCWest after a trial for his lay off with the company and still he needs crowdfunding and player donated content for his game..? Truth be told, I'm totally no fan of survival games. Games list MineCraft, RUST and other so-called survival games are a gankers paradise because of their full-loot PvP. I to like the building part of those games, but only because of the PvP done so wrong I really hate them. Tree of Life is 'yet am other' survival game, but this it's developer (Odd One Games) has done things right. While there is PvP (well, PKing) in the game, OOG has taken a different approach on it. Instead of the full loot upon death that's pretty common in the genre, Tree of Life only had this option available for players who are red (i.e. criminal stats after theft or PK). If you're in 'normal standing' (yellow) you'll only drop 1 random item from your inventory (and I was lucky enough to drop all my money one ). Then the building of stuff. Tree of Life takes it big. And when I say big, I really mean BIG! You start with only a couple of twigs, 2 bread (150 feed), a bandage and a box of 20 matches when you strand on the isle. From there on it's up to you to survive and build stuff and you'd best start with hitting trees. These are the main resource for wood (duhuh ^^) and drop apples as well (which you can eat, though they give more feed when you've grilled them). Along the way you'll increase your skills, both combat and crafting. And there are a lot of skills in the game! I've counted around 30 of them and I haven't even started on at least 10 of them. Good thing with the skills is that one skill needs to be at a certain level before you can build something to get started on an other one (or you just use a facility someone else had build already). Night time is a time to lay low for us mortals because the undead (zombies and skeletons) will rise. When you've just stranded on the isle, the main advice is RUN! They hit hard and you can't have so many hits. For my by now I hunt them because of the money and rotten flesh they drop. Though nasty, I need the rotten flesh as fertilizer for agricultural purposes (you can also grill it and it's edible). I'm not one to complain about customer support departments from Free2Play games. I realize that they are mostly understaffed and thus have a lot to do. But I wonder how capable the customer support of Gravity is. Last week I tried to logon to my old account there. After a bit of trying I finally logged on. It's been a while that I last logged on there. Next up I wanted to download Ragnarok (wanting to play something old and different for a change) and clicking the download button I had to logon again (silly system I must say) only to be forwarded to my account page to tell me that my account is suspended. We apologize for the inconvenience that you experienced due to this issue. Please be informed that your account was associated to another user that was involved in ill-mannered activities, however, after a thorough investigation, your account has been cleared from the issue. I am pleased to inform you that your account has been released from suspension. I have just received an email from Gravity that my tickes has been resolved and closed. I'm not sure what they did, but now I can't logon on either the old or new email address. Too bad, guess it'll be Ragnarok on the EU server through Steam then. I have received an email for a private Blade & Soul server a couple of months ago already but I ignored that one. Earlier this week that same private server also advertised on MMORPG.com (which is forbidden there), but I gave it a try anyway. I honestly gotta say that so far I am impressed by the game. I expected a pure beat 'm up kind of game, but it's far from that. Blade & Soul is more an action MMORPG (similar to TERA) with several classes where martial arts is only a fraction of the game. The characters use martial arts more in a way of movement than just as skills. I always thought I'm no MOBA player. Reason being is that I tried quite a couple of them in the past. Honorable mentions who tried to pull me into the MOBA genre are Dota 2 (of course), League of Legends (of course once again), War of Angels (PWI title) and a couple more that I don't remember anymore. I always thought that the content was too much of the same in all those games and that leveling your toon just was a grind to the top (like with most MMORPGS). But you gotta leave it to Blizzard to make a genre that's no fun (for me) and make it fun. 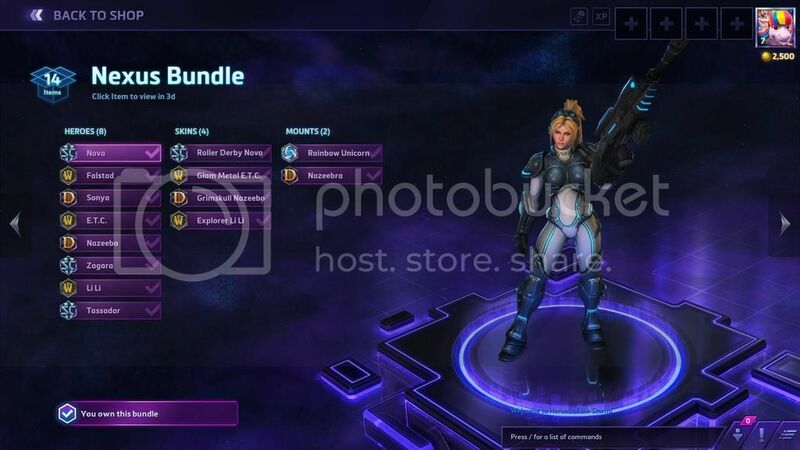 Heroes of the Storm is yet an other MOBA on the surface, but it has so much extras underneath the game. For starters, the heroes you can play with are main characters from the Blizzard games (for obvious reasons), and if you have played one or more Blizzard games in the past you can familiarize yourself already with them. Not to mention, you also know somewhat what to expect from your hero if you've play them in the other Blizzard title. An other interesting feature that Heroes of the Storm has added are the maps. Right now there are 7 different maps and each map has it's own game mechanics. These mechanics in the end all come down to the same thing: get a lot of power to bring down your opponent's defences. But it's the way that these mechanics are incorporated that makes them fun to play. Even the Haunted Mines map (video is below) that I thought was no fun to play at start grew on me and kinda has become my favorite map to play on! The only problem with this game is that it's still in beta. And unless you don't have key from one promotion or an other, you have to buy yourself into the game for �35 for the Founder Pack. And while I had a key it didn't take long for me to decide to grab one of the game's packages. Last weekend the Nexus Bundle was on sale with 68% off for 'only' �40 and honestly, this bundle is a whole lot better than the Founder Pack (*YAY* for having a beta key). By now I have already played Heroes of the Storm for over 6 hours and it's still growing on me. I think this might be the next big thing that I'll be diving into for online gaming! An other thing I totally dig about TSW are the puzzles they have put in the game. Most MMORPGs just tell you to kill 10 rats (there we go again ) to level up. And while TSW knows this kind of quest as well, it's not the majority of quest type you get - you're more busy doing puzzles in the game and trying to figure vague hints out than that you run to the place where X marks the spot to do your thing. Okay, that last statement it not totally true in TSW, because a lot of quests actually show the approximate location where your objectives are, but there are also a large number of quests that just tell you have to find a person in a certain place (or even on a map ). The things that I do hate about TSW though are two things: zombies and progression rate. Zombies for the simple reason that I don't think they are a horror factor AND that they are way too agile and fast to their original (80s) roots. I mean they almost outrun me and hit like a mule. Then again, TSW is a post-apocalyptic setting and zombies are a possible scenario for it. And I gotta say that the way the zombies are presented in all their variety that FunCom did a pretty good job (but still I don't like zombies...). Then about progression rate... As stated above, you progress through the skill wheel and that's also where most of your powers come from. It's not like most MMORPGs that better gear gives you most of your power (it does help in TSW though), but it's those 7 active and passive skills that define your powers. And that's just where the problem lies. The further you come on the skill wheel, the more points you need to fuel the new skills (not saying that this is a bad thing!). The bad thing is that when you're on your main mission, you need to do the sub missions on the map more than once (half a dozen times or more on higher skill levels) to gather enough skill points to fuel the skill wheel and be able to continue on your main mission. And that's what I really hate about TSW - I have to grind the same missions over and over again for my progression, without an alternate way (crafting to name one) to progress. I really like Phantasy Star online 2, or the whole IP for that matter (which is also one of the reasons I picked up my PSP and PS2 again ), but Phantasy Star online 2 is one I'll wait a bit for. With that translation patch only covering 75% of the game, I'm also starting to miss out on a lot of storyline stuff. A lot of NPCs I'm talking to by now only speak Japanese. And though the objectives in the end might seem clear, it's pretty annoying for me that I have no clue what they're actually telling me. I think for now I'll just wait till the EU/US version of PSO2 will be available OR until there's a better and more complete translation patch available for the Japanese servers.. I've played a lot of MMOs over the years, but Phantasy Star online 2 does things very different. Aside from the obvious difference in the action based combat, it also holds some pretty neat events. On new-year's eve I played the game pretty late and there was a system announce that a concert would be given in a short bit. I was curious and decided to take a peek. To my surprise it was a small concert of 2 songs. The songs were a typical example of Jpop and I honestly have to say that I liked it a lot.